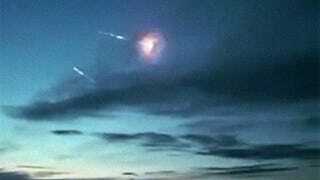 Death falling from the sky: This unique video shows the warheads from a Russian Intercontinental Ballistic Missile re-entering Earth's atmosphere and hitting their targets at the Kura Test Range, located in northern Kamchatka Krai, a Russian Federation territory north of Japan. The graphic shows the launch of a Minuteman III, which are comparable to the R-36 created during the Cold War by the Soviet Union and still in use today. Unlike the Minuteman III's three warheads, some variations of the R-36 had up to 10 warheads. Phase 1 is the launch. The stage separation process that takes the missile head to space follows. On phase 5, the MIRV (Multiple independently targetable reentry vehicle) maneuvers to get ready for targeting and reentry. On phase 6, the warheads and the fake warheads designed to confuse the enemy's anti-missile defenses are deployed. On phase 7, the warheads re-enter the atmosphere while they are armed. And finally, on phase 8, the warheads explode either on impact or above the target. Of course, these warheads didn't have their nuclear load—since nuclear tests are banned, that would have meant World War III. But imagine seeing that in the sky and wondering how would it be to feel the intense heat of the explosion, followed by its shockwave, just a few seconds after.